The transition from college to the work force isn’t always what it seems. I think that the perspective I had as a college student was “as soon as I graduate – I’m getting a job! I actually spent close to a year and half looking for a job post-college. It was a rough time in the economy and finding a job was difficult. When I was finally offered a position with the company I currently work at – a new dilemma arose. I was entering the corporate world, and I had nothing to wear! The clothes I owned were purchased in different stages of my life. I had casual college clothes, restaurant uniforms and I had an interview outfit (or 2). My adventure of navigating the work force is approaching three years and I have found that there are a few must haves to invest in. I personally am trying to add more color to my wardrobe but I think that black and white pieces suggested below are great for a foundation. The articles of clothing you select should be of good quality, something that has a classic style to last throughout trends and in your budget. Upgrade later! 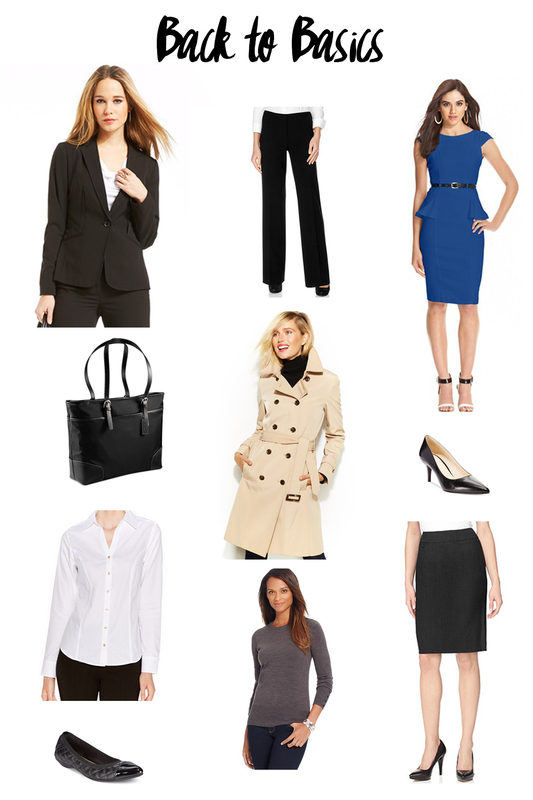 The black blazer is the quintessential “I run the world” piece. Not only does black go with everything, but you can also dress it up and down. Whether it is with a nice trouser, a pair of jeans and heels, or over a dress, the black blazer is a staple for your wardrobe. When choosing a blazer, makes sure that it fits you perfectly and is the right shape and cut for your body type. It doesn’t have to be an expensive purchase – find one that is comfortable and that you feel good in it. I recently invested in the Calvin Klein Tuxedo Blazer and I am ready to take it out for a spin! (Currently on sale at Macy’s too!) Click Image. Black Trousers are kind of a big deal. Owning a pair of good quality, well fit pants is hard to understand if you currently don’t have a pair. Find trousers that have a flat front and flatter your figure because you don’t want to spend your day fidgeting in them. They can be paired with a nice sweater, a button down shirt, a blouse or even a t-shirt on occasion. I have been lucky to find some great pairs at the outlets during the fall season when they become more abundant. Tip: Try on every pair that you want to buy and see how you feel in them. Don’t choose by brand or what size you think you are. Every style and cut sits differently on your body and want that “I don’t want to take these off” feeling! 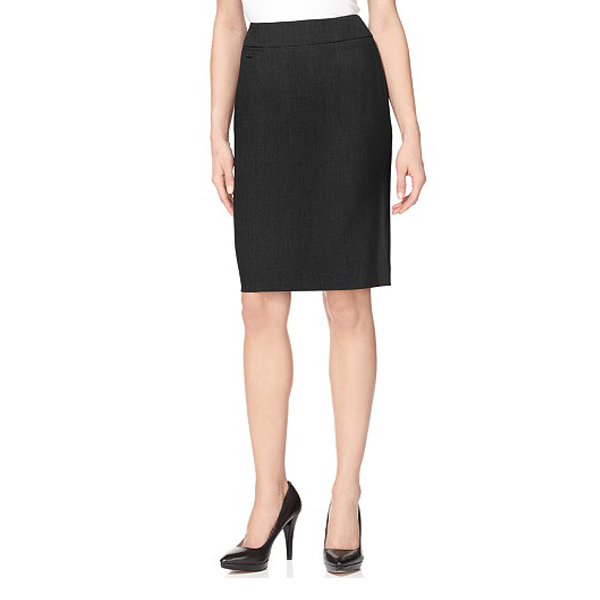 Pencil skirts come in all lengths but try to find one that is closer to knee-length. If a pencil skirt isn’t your cup of tea, try an A-line skirt instead. Pairing the skirts with a nice blouse and cardigan are perfect for those meetings days or just your everyday. They truly can be worn all year round and are a great piece to have. I started with just one black skirt and now I have skirts in navy blue, heather grey and even in maroon. Great basic piece to own! This always seems like the easiest option to own since you can find them anywhere, but it has taken me some time to find one I really enjoy wearing. A crisp and clean white button down shirt should fit you and flatter you at the same time. Consider the following when you are looking at buying a classic white button down – The material, the actual structure of the shirt, the care needed to maintain the quality as well as the style. Is it you? Do you feel authoritative and professional in it? Is it easy to take care of and wear? Once you’ve found one that is a 10 in your book, you can pair with your trousers, the pencil skirt, throw a blazer or cardigan over it or incorporate it as a layering piece. The possibilities are endless. When you work in an office, there are days where you can anticipate being on your feet all day or you just don’t feel like wearing heels. Basic Flats are always a good to have either at your desk or carried in your purse to give your puppies a rest. I have found that the H&M ballet flats are great for carrying in my bag since they are slim and fit easily. (currently on sale for $4.99) Besides the basics, you should own a good quality flat that will last you through the years. Again, I always favor a black flat since I can put it on with anything but make sure the quality to last is there. Your feet will thank you for it. You may think, why do I need a dress? I didn’t think that having a dress would translate into the 9-5 world gracefully but it has been a handy addition to my wardrobe. My first work dress was actually the dress that I purchased specifically for my interview. It is a Gray Calvin Klein Cap-sleeve button down dress that I found at Marshalls and I still wear it to this day. Find something form fitting and sophisticated. I love Peplum so found a great option. (click image) Plus it is great for those days you need to the leave the house quickly – a stand alone piece. Step outside your comfort zone and try on something you think you would never wear. You might be surprised and love it. Layering is a great way to change up your outfits. Whether it be a cardigan or a crew neck sweater, they will mix and match in well with your corporate wardrobe. Start with neutral colors that will incorporate easily into your style. I have crew neck sweaters in black, maroon and olive green. I can wear them alone, put them over my button down with a nice necklace or pair them with blouses over skirts as well. Pay attention to the material – don’t forget that you are buying quality not for quantity for these staples. You want them to last. It has been extremely helpful having a purse that can also transform into a pseudo laptop bag when necessary. Think about what you need to make your day function and ask yourself if you can also fit your laptop in there? For example, a black leather bag can be the perfect carry all for your day. I have found a Samsonite bag that is on sale at Macy’s that would be perfect! (click image) I have a Michael Kors Jet Set Tote and it is perfect for daily life as well as work. It has been extremely useful as a travel accessory since it is the perfect size for a carry-on. Multi-functional and high quality – just the way I like it. There are many styles of coats available (especially in New England where the weather is changing seasonally), but its always hard to choose just one. Last Fall, I purchased a DKNY beige + leather combo trench coat and it has been one of the best purchases I’ve made in a long time. I have thrown it over dresses and work outfits, or just to go walk the dog with my mister. This versatile piece is perfect for the fall season when the weather is not quite cold yet but chilly enough for an extra layer. Some people prefer the all beige trench but it is important that you pick a style that works for you and your personality. Most importantly, make sure the trench fits you at the shoulders, you don’t want to look as if the coat was not made just for you. I am currently on the hunt for a quality wool coat that I can rock for the years to come. I hope I find one soon… Winter is coming! Bonus Items : Get yourself a classic watch that will never go out a style, a scarf and a set of pearl earrings. Build out your accessories to change up the wardrobe as you please. Have fun with it! Thank you so much for reading! Let me know what some of your closet favorites are below. Hey girlie! I’m following your blog on BlogLovin as well. My website is up there too ElleToshea.